Title You may recall that last April, I blogged the A to Z of Statistics, and the very first post was alpha, or the type I error rate. This year, I'm blogging the A to Z of R, and this post is about a different kind of alpha - Cronbach's alpha, a measure of reliability, specifically internal consistency. You can find more detail about Cronbach's alpha conceptually by checking out today's Statistics Sunday post. 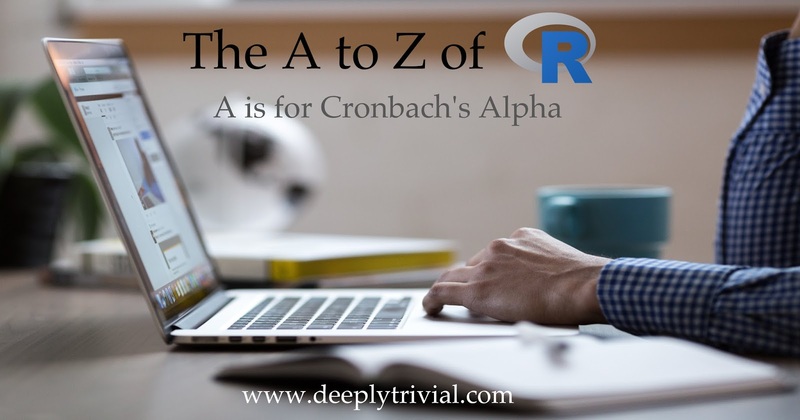 This post focuses on how to compute Cronbach's alpha in R.
To compute alpha, you'll need a set of items (at least 3) that measure the same concept. Determining if items measure the same concept is a validity issue, but it doesn't really make sense to examine reliability when you have no evidence that the items measure the same thing. For my example throughout much of this month, I'll use the dataset from my Facebook study, since the dataset includes 6 published measures that have previous evidence of reliability and validity. I created a "small" version of the data - one that only includes ID, gender, and responses to the 7 measures. Because this is only for demonstration purposes, I don't really want to share my original dataset - I'd rather, if people are interested in a copy, that they reach out to me and request it officially - but I did create a simulated dataset, which has similar means and correlations as the original data, and is formatted in the same way. You can download that dataset here to analyze along with me, as well as a mini codebook here, but note that your values will differ slightly. Make sure that when you save it to your computer that you either put it in your R working directory or that you change your working directory to the folder you saved it in. If you downloaded the simulated dataset referenced above, that file has the same columns and reversed items. I can get more detailed output (check out a sample here) by requesting the full object (Savoring, without the summary part), which tells me what would happen to alpha if I dropped a particular item and provides statistics for each item (e.g., mean and standard deviation, proportion selecting each response option, and so on). As with check.keys, you'll receive a warning. You can read the document of the alpha function in psych here. There are many other options you can specify, such as number of iterations if you want to bootstrap your confidence intervals, or number of observations if you have a correlation matrix instead of raw data. What I've provided you above are the ones that you're most likely to need when examining alpha in a dataset. I thought this blog admin is having well experienced because these posts are very creativity and very depth explanation. Thanks for sharing the unique details about this topic. The blog exposes lots of things to learn about this topic. Very useful things given by the author.